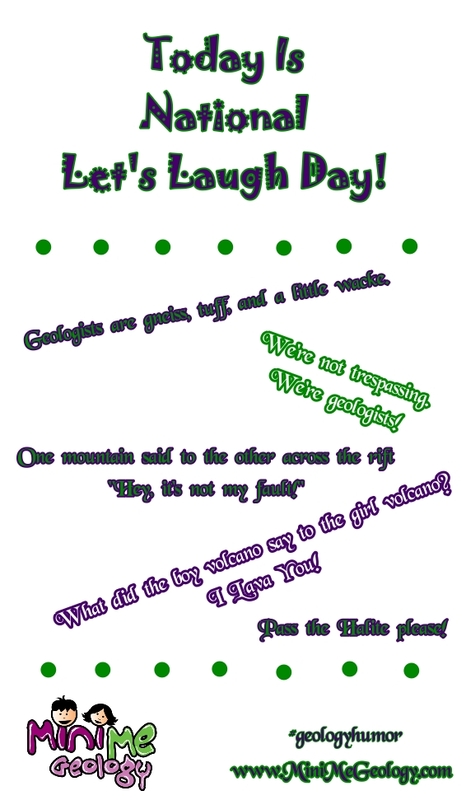 Mini Me Geology Blog » Today is National Let’s Laugh Day! Today is National Let’s Laugh Day! Today is National Let’s Laugh Day! In the spirit of all things funny, here is some of our favorite geology humor. THE TOP 10 SIGNS YOU MIGHT BE A GEOLOGIST! Top 10 Signs You Might Be A Geologist: #9 You have taken a 22-passenger van over “roads” really intended only for cattle! Top 10 Signs You Might Be A Geologist: #8 You have had to explain to airport security that a rock hammer isn’t really a weapon. Top 10 Signs You Might Be A Geologist: #7 Your rock garden is located inside your house. Top 10 Signs You Might Be A Geologist: #6 You have ever hung a picture using a Brunton & your rock hammer. Top 10 Signs You Might Be A Geologist: #5 Your collection of beer cans & bottles rivals the size of your rock collection. Top 10 Signs You Might Be A Geologist: #4 You think a “recent event” is anything that has happened in the last 100,000 yrs. Top 10 Signs You Might Be A Geologist: #3 Your photos include people only for scale & you have more pictures of your rock hammer & lens cap than of your family. Top Ten Signs You Might Be A Geologist: #2 You have been on a field trip that included scheduled stops at a gravel pit and a liquor store. Top Ten Signs You Might Be A Geologist: #1 You have ever uttered the phrase “have you tried licking it” with no sexual connotations involved.